For some families, reduced sugar snack treats mean Grandmother's warm apple pie or Aunt Jean's chocolate chip cookies. No discounting the greatness of family recipes. These are traditions without which family meals are not complete. But this season, Americans may be taking a different route to a great-tasting dessert- reaching for reduced sugar snack options instead. Now, it is easier than ever before to cook and bake reduced-sugar treats by using the all-new SPLENDA® Brown Sugar Blend - a mix of brown sugar and Splenda Brand Sweetener - great for those looking to lower their sugar intake without sacrificing taste. 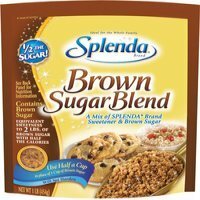 Splenda Brown Sugar Blend can be used almost anywhere brown sugar is used because it retains its sweetness under high temperatures with a great molasses flavor and moistness. Preheat oven to 350 F. Lightly spray a 13-by-9-by-2-inch baking pan with vegetable cooking spray. Beat 1/4 cup butter and 1/2 cup Splenda Brown Sugar Blend at medium speed with an electric mixer until blended. Add egg yolk, beating until blended. Add flour and salt; beat on low speed until blended. Press mixture into bottom of prepared pan. Combine butter, Splenda Brown Sugar Blend, corn syrup, evaporated milk and vanilla extract in a medium saucepan. Cook over low heat, stirring constantly, until Splenda Brown Sugar Blend dissolves. Bring mixture to a boil over medium heat and cook until candy thermometer reaches 265 degrees (about 10 minutes). Pour mixture over crust and spread evenly. Bake 10 additional minutes. Cool 5 minutes on a wire rack. Combine chocolate squares and Splenda Brown Sugar Blend in the top of a double boiler; bring water to a boil. Cook until chocolate melts and mixture is blended. Drizzle over toffee. Sprinkle with chopped pecans. Cool completely on wire rack. When chocolate is firm, cut into bars or diamond shapes. Store in an airtight container. Nutrition information per serving (serving size: 1 square):150 calories, 70 calories from fat, 8 g total fat, 3 g saturated fat, 15 mg cholesterol, 30 mg sodium, 20 g total carbohydrate, 1 g dietary fiber, 15 g sugars, 2 g protein. Dietary exchanges: 1 1/2 starch, 1 fat. This recipe, when compared to the traditional recipe, has a 22 percent reduction in calories, a 34 percent reduction in carbohydrates and a 40 percent reduction in sugars, making it a perfect reduced sugar snack for the whole family. As time passes I will add recipes and I also ask that you submit your favorite reduced calorie snack recipes as well. I'd like for this to be a safe place for us weird "healthy" people to share our healthy meal planning tips and ideas as well as workout routines that keep us healthy and strong.